In the waning hours of the 19th century, a five-foot-two inch, 17-year old named Carlos Bianchi left his native Parma, Italy, arriving in the New World to change his name from Carlos to Charles and, a few years later, from Bianchi to Ponsi. In 1907, as Charles Bianchi, he turned up in Montreal working as a clerk at the Banco Zarossi. Owned by a con man named Luigi Zarossi, the bank offered exceptionally high interest — actually double the going rate — to scam recent Italian immigrants to Canada. Because the bank’s investments couldn’t possibly earn enough to justify those rates, when Zarossi’s older clients wanted their money back, he paid them with whatever money came in from his newer clients. That made people think the bank was sound — which it wasn’t — just long enough for Zarossi to amass a large enough stake that he could live the good life as a fugitive in Mexico. Robbing Peter to pay Paul was an old trick. One of the earliest sightings having been in 1899 in Brooklyn, when William “520 percent” Miller, kept anxious investors at arm’s length, offering 10% profits per week on insider-share dealings, then paying off the first investors with money from the latest investors. He and his cohorts accumulated $1.2 million before the scam collapsed and he was sentenced to 10 years. Once Zarossi was gone, Bianchi found himself unemployed and needing money, so he helped himself to a former client’s blank check and forged the man’s signature. He hoped it would get him back to the States. Instead, it landed him in a Quebec jail for 20 months. Released, and with no place to go, Bianchi heard that he could earn money helping to smuggle Italian immigrants into the US. He signed onto that scheme, got arrested by the American authorities and wound up doing two years in federal prison in Atlanta. After bouncing around for the next several years, by 1919 he’d changed his name to Charles Ponsi — then altered the spelling to Ponzi — turned up in Boston, got married and looked around for a way to make a living. He failed in several businesses before he started working a petty scam selling ads for a proposed magazine. He offered an ad deal to someone in Spain, who then wrote back that he wanted to see a copy of the magazine, and enclosed an international reply coupon. Still in existence today in around 70 countries — including the US — international reply coupons are, if you will, the global answer to a self-addressed stamped envelope. Because the man in Spain couldn’t buy American stamps to pay for the return letter from Boston, he’d purchased one of these coupons from his local post office which Ponzi could then exchange at his local post office for postage to Europe. Ever curious, Ponzi quickly discovered that these coupons were priced at fixed rates of exchange. But from his years working in the Canadian bank, he knew that actual currency rates fluctuated. The man in Spain had paid the equivalent of 1-cent for the coupon, for which Ponzi’s local post office was willing to hand him a 6-cent stamp. Today, we call what he did, arbitrage. On paper that was right. And there is no doubt that he promised the world he would do just that when he opened his Securities and Exchange Company — long before the initials SEC meant anything else — to buy and exchange these coupons. Except he didn’t bother buying or exchanging anything. Instead, he claimed that because he didn’t have any money, and couldn’t borrow any from a bank without disclosing his plan — he said he didn’t want to give the bank a chance to do the same thing — he put his hand out to the public. A dapper man with a walking stick, straw hat and boutonniere, Ponzi played the entrepreneur to the hilt. He first promised the public 50% profits in 45 days. Money came in. Then he upped it to 100% profit in 90 days. Now the floodgates opened. On good days, hundreds of thousands of dollars arrived at his SEC. By that summer, Ponzi had accumulated enough money to buy a 12-room mansion in nearby fashionable Lexington — it’s said to have came complete with such novelties of the day as air conditioning and a heated swimming pool — and a controlling stake in the Hanover Trust Bank of Boston. Just like Banco Zarossi, Hanover Trust also catered to a growing Italian immigrant population. Running it provided Ponzi with an heir of total respectability, which meant that, now, even more money poured in for his postal reply coupon scheme. But just like Luigi Zarossi’s high interest rates, Ponzi’s astronomical profits were nothing more than pie in the sky — in fact, he never actually bothered dealing in the coupons at all — and simply paid his first investors with money from those investors that followed. What supposedly happened next was odd. Towards the middle of 1920, the Boston Post newspaper ran a glowing article about him. But a furniture dealer who’d sold him chairs and tables, sideboards and armoires, and had never been paid, complained that Ponzi’s checks bounced. It doesn’t make a lot of sense, seeing as how Ponzi was running his own bank and, anyway, had enough coming in to pay his bills. What’s more, the furniture dealer is said to have sued and lost. Whether that actually happened is immaterial, because once the claim was made that Ponzi wasn’t paying his bills, the Commonwealth authorities began asking questions, and the Boston Post took another look. In those days, a domestic letter cost 2-cents, and an international letter 6-cents. The Post asked Clarence Barron, the financial analyst who published the still highly respected Barron’s newspaper, to do the math. Barron calculated that for Ponzi to be covering all his investments, he had to be dealing in no fewer than 160 million reply coupons. But the US Post Office was reporting that only about 27,000 coupons were actually circulating. And even if Ponzi had somehow cornered the entire issue of postal reply coupons throughout the world for the past six years — which he clearly hadn’t — even then, his profits would have been only around $500,000. The Post now ran a story bursting Ponzi’s balloon, which caused a run on his SEC. Investors demanded their money back. While still proclaiming the potential for massive profits — obviously hoping to draw in new investors — Ponzi paid out more than $2 million. At the same time, he did what conmen typically do when faced with the truth. He sued the messenger. Ponzi filed a $5 million claim for damages from the Post and, in the next breath, announced a $100 million international investment syndicate. The paper decided that if the interest was included on Ponzi’s outstanding notes, he was at least $4.5 million in debt. Ponzi responded, because he dealt directly with foreign governments to purchase the vast quantities of coupons he needed, and because those governments profited from the coupons, too, he simply could not reveal any actual figures. But, he insisted, the money was there. The Post responded with the headline, “0+0=$”. The Feds raided Ponzi’s SEC offices and the Commonwealth of Massachusetts shut down Hanover Trust Bank. 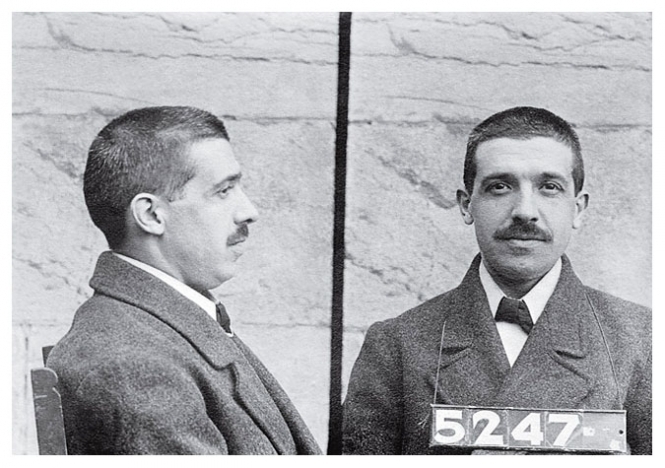 On August 12, 1920, the day he was arrested, Ponzi’s liabilities were put at $7 million. Interestingly enough, the raid on his offices failed to find any postal reply coupons. In fact, the grand total of his actual arbitrage was said to be a mere $30. It meant that Ponzi never even bothered with his international postal reply coupon idea. Which would have worked. There’s no way he could have made millions, but had he actually done it, he definitely could have earned himself a modest income. For its relentless reporting, the Boston Post — which by now had discovered Ponzi’s criminal past and published his mug shots from the Montreal — won a Pulitzer Prize for its efforts. But in little more than eight months, some 40,000 investors had handed Ponzi a reported $15 million. In the end, tens of thousands of people had lost their life savings and half-a-dozen banks had crashed. In September, 22 indictments were returned against him by the Commonwealth of Massachusetts, charging Ponzi with larceny. A month later, the US Government charged him in two indictments with a 86 counts of using the mails to defraud the public. He pleaded guilty to the first count of the federal charges, and was sentenced to five years. At the same time, he argued that Massachusetts had no right to charge him as well. It was a question of jurisdiction rather than double jeopardy, because he wasn’t being tried twice on the same charges, even if both cases covered the same crimes. And that case went all the way to the US Supreme Court. The decision was written by no less a jurist then the Chief Justice himself, the former 27th president of the United States, William Howard Taft. He came down against Ponzi. So, as soon as he was released from the federal facility — where he served three and a half years — Massachusetts proceeded with their case. After two deadlocked trials, Ponzi was found guilty at the third trial and sentenced to seven-to-nine additional years. He appealed and was released on bail, at which time he skipped to Jacksonville, Florida where, as Charles Borrelli, he set up a syndicate to sell swamp land. Indicted, tried and found guilty there, he appealed, was released on bail and skipped again. He tried to flee the country, but he got caught and was sent back to Massachusetts where he spent seven more years in jail. Freed in 1934, the government promptly deported him to Italy. The New York Times reported that during those years, he attempted to swindle Stalin’s government out of $2 billion by promising to smuggle gold into the USSR, then helping the Communists deposit it in European banks. But the Russians wouldn’t fall for it. Eventually, he got a job with an Italian airline that took him to Brazil, but the airline folded at the beginning of WWII. Ponzi lived his last years there, teaching English. In 1948 he suffered a stroke and died in Rio de Janeiro a few months later at the age of 66, penniless. And his spirit blithely lives on. Author, journalist, television pundit and keynote speaker. In short, just an old-fashioned storyteller.